For the stag pack the price is £47. 32 and the apple pack is £54. 64 but has durabright. I contacted epson and was told there was no difference, can you explain. Thank you for your question. After reading the product specification on our website, the Durabright pack says "The Epson multipack T1295 ink contain DURABrite Ultra Ink for superior print performance. This resin-coated pigment ink is fade, water and smudge resistant, leaving you with durable prints that will last for up to 200 years when stored in a photo album". To enjoy impressive prices on Epson BX625FWD supplies, why don't you try us for size. We have got the complete range of BX-625FWD inkjet cartridges available to buy, which means you really do not have to waste your time going to any local businesses trying to get the savings like those we offer here. Always remember, any time you shop for some Epson print cartridges from us you'll even get 100% free next day delivery as standard, so you can retain the money saved thanks to our renowned lower costs. Apart from that, everything available at our store comes bundled with a full money back guarantee as well as our hassle-free cartridge returns scheme - if you're not satisfied with one of your BX625FWD cartridges then neither are we. 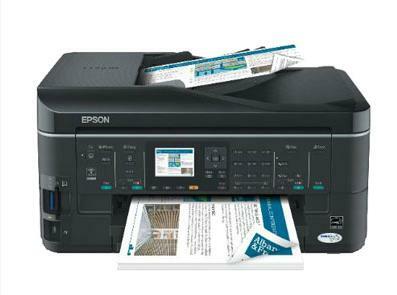 The Epson Stylus Office BX625FWD is an all-in-one printer ideal for small offices and homes. Though it is bulkier than other lower-end printers from the Stylus Office line, it is a hardworking and reliable choice. Resolution is 5760 x 1440 dpi, and input tray capacity is 250 sheets. A bit boxy, the black and sleek Epson Stylus Office BX625FWD is aimed at the SOHO market. This space saving machine is neat and compact, as all the paper trays as well as the document feeder can folded in. This multifunction can scan, fax, and copy. It features a control panel with coloured LCD screen. Increase productivity with the 30-sheet auto document feeder and the tape cassette, which can also carry photo blanks and A4 paper. The duplexer saves time and money. The Epson Stylus Office BX625FWD produces laser-like quality prints at 50% less than the printing cost of a laser printer. Designed to handle multiple computers, the Epson Stylus Office BX625FWD boasts Wi-Fi and integrated Ethernet. Though the Epson Stylus Office BX625FWD already features a coloured LCD screen, the text is a bit hard to read and the buttons on the control panel can be confusing for new users. The print quality is adequate, but is is certainly not the best in the market.